Our Long Island, New York Bed and Breakfast is just past the Village of Greenport, a place rich in history and cultural offerings. 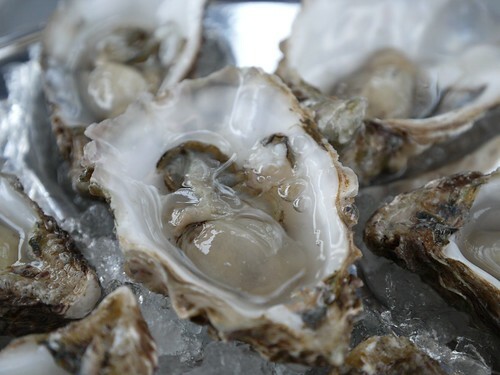 If you like your oysters fresh, dine in Greenport, Long Island. Situated on a south facing deep water harbor, Greenport was once home to a thriving shipping, whaling, and shipbuilding industry. In the early 1800s, Greenport was such an important hub that the Long Island Railroad was created to connect it to New York City, and ferry lines were established to connect it to Connecticut. Today, the waterfront village of approximately 2,000 is a cultural hub, with numerous restaurants, shops, and historical sites. It is on the “must see” list for guests of our Long Island, NY Bed and Breakfast. The Harbour Front Deli and the Stirlington Deli both offer a good selection of sandwiches, hearty soups, and other treats, with fast, friendly service. Eat in, or grab your meal and enjoy it at the beach. Aldos has superlative coffee, cocoa, and pastries. The Bistro Bar Menu at Bruce’s Cheese Emporium features many local “Farm to Table” items: wine, beer, cheese, and produce. The Chowder Pot has great views of Peconic Bay and Shelter Island, and even better chowder. The Metro Cafe has generous burritos and other southwestern fare. And it’s hard to beat the pizza you’ll find at La Capricciosa Brick Oven Pizza. There is also fine dining on the North Fork of Long Island. If you want to step out, step into Porto Bello Restaurant. Or try The Frisky Oyster Restaurant, a relatively new spot that has garnered rave reviews from the NY Times, and a rating of 26 from Zagat’s; they’re food is consistently good. If you’re young and hip and miss the city a little during your Long Island, NY Bed and Breakfast retreat, you’ll be happy at the Frisky Oyster. If you’re a bit older, perhaps, and prefer your dining experiences to be steeped in tradition, try Claudio’s. The original Claudio arrived in Greenport in 1854, with the Portuguese Whaler “Neva”. After many more voyages on the “Neva”, Manuel Claudio had enough resources to stay on dry land for the rest of his life. In 1870 he opened Claudio’s Tavern; it’s been in the family ever since. Folks interested in hitting all the major North Fork Tourist spots will want to check out Claudio’s. Noah’s is the only restaurant in Greenport with a raw bar; it offers several varieties of oysters daily, shucked to order. Noah’s features small plates, with small pours of wine to match, at affordable prices. It’s one of our favorite places to dine (and we’re not alone–Zagat’s has given it a 27). If you’ll be staying at our Long Island Bed and Breakfast on New Year’s Eve, consider having your New Year’s Dinner at Noah’s. New on the Greenport restaurant scene is the North Fork Oyster Company. Their oysters are delivered the day their harvested, and they pour Greenport Brewing Harbor Company draughts. Even though The North Fork Table is outside of Greenport, in Southold, it should be included on this list. The North Fork Table is considered the best restaurant on North Fork, Long Island. The James Beard Foundation named it the 2011 winner for North Fork, the East End, and the Hamptons. Zagat’s has given it a 29. The food is fresh, the menu inspired. Eating a good meal is one of the best winter activities there is. Dipping a pastry into coffee, tea, or cocoa is another. So go ahead. Take a blustery beach walk, and work up a powerful appetite. Then head down the road to Greenport, and eat to your heart’s content.